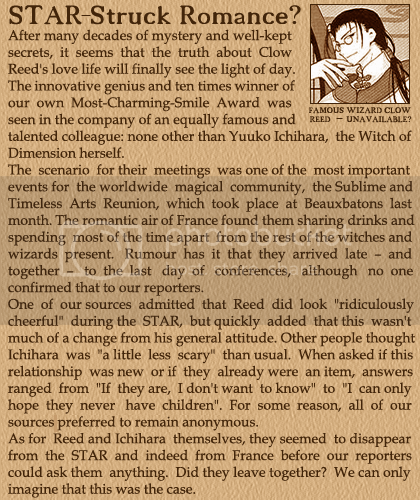 Summary: Clow/Yuuko as told by Witch Weekly. *cackles* Pure awesome. Thank you so much for writing this. *dies* You always manage to impress me. Lo de Dumbledore siendo entrevistado al respecto y diciendo aquello del "free time" WINZ. "Can only hope they never have children"
This made my day. Fantastic. XD XD XD Well, if you have no life, at least you have devoted fans who will laugh like proverbial loons at your genius. Yuuko's & Clow's revenge on Witch Weekly is inspired. Praise and Adulations and Sh*t.
Perfectly Clow, Perfectly Yuuko, Perfectly The Press. The strawberry jam and hot chocolate --marvellous touch. 'One too many' being my last margarita. You owe me a floor i broke mine laughing!LOL! Heee. This is beyond wonderful! I especially love Yuko's response!